Combine first 9 ingredients in a food processor or blender; process until smooth. Place onion mixture, beef, and bell pepper pieces in a large zip-top plastic bag; seal. Marinate in refrigerator 20 minutes. Remove beef and bell pepper pieces from bag; discard marinade. Place beef, bell pepper pieces, and plantain pieces in a large bowl; toss well to coat. 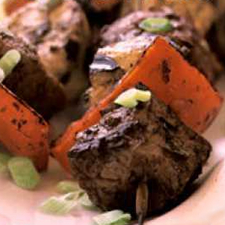 Thread 5 beef cubes, 3 red pepper pieces, and 3 plantain pieces alternately onto each of 6 (12-inch) skewers. Lightly coat kebabs with cooking spray. Place kebabs on grill rack coated with cooking spray. Cook 4 minutes on each side for medium-rare or until desired degree of doneness. Garnish with green onion pieces and serve with lime wedges, if desired. Per Serving (per kebab): 226 Calories; 5g Fat (19.9% calories from fat); 2g Saturated Fat; 24g Protein; 22g Carbohydrate; 2g DietaryFiber; 66mg Cholesterol; 423mg Sodium. Exchanges: 0 Grain(Starch); 3 Lean Meat; 1/2 Vegetable; 1 1/2 Fruit; 0 Fat; 0 Other Carbohydrates.